Bent on cruising the North Channel—a small strip of water between Manitoulin Island and northern Ontario, Canada—my husband, Larry, and I sat out yet another windy day in port. A sad but inescapable conclusion was becoming apparent: we had to rethink our agenda. A late start from our homeport of Erieau, Ontario, (in early August instead of early July) did not give us time to get to Tobermory or the cruising grounds beyond before the September fogs appeared. Too many days of high winds had forced longer stays than we had expected, so now we had to go to Plan B: turn the trip into a vacation! Docked in the beautiful town of Kincardine, we were only halfway up the 200-mile trek to Tobermory. The very waves that halted us at this Lake Huron port gave the impression that we were looking out from a Caribbean Island. The water was an incredible azure-blue and the sand very white and rimmed by a small area of dunes. Definitely not our usual Great Lakes&apos; outlook! It is not surprising that most newcomers to this area have a hard time believing that the huge expanse of water in front of them is just a lake. It was surely worth a thorough perusal. Exploring Kincardine Leaving our 1980 32-foot Marine Trader, Just Us, gently swaying at her berth in the protected harbor, we set out for a sustaining lunch. We headed up the hill from the harbor and found a table at the crowded Erie Belle restaurant. An order of their famous fish and chips, washed down with some glasses of a very dark beer, was every bit as good as we had heard. Next it was off to the town&apos;s main street to hit the small supermarket for supplies. I meandered back, checking out the numerous gift stores and stopping at the public library to check e-mail. Kincardine proved to have all the requisite supplies for the boater. However, what sets this town apart from others is the nightly tribute to its Scottish heritage. Six nights a week during the summer months, the "Phantom Piper" appears in the lighthouse at sunset and pipes the sun down. Not a particular fan of bagpipe music myself, I could not help but be moved by the haunting strains as they met wind and water. This beautiful tradition is performed in memory of a piper who played his pipes on shore to guide a boatload of lost settlers to land. On Saturday nights, the bagpipes combine with a full marching band in a parade down Main Street. Crowds line the road, and many follow the marchers on their route. An important part of the ritual is enjoying an ice cream afterward. I&apos;m sure that both of the town&apos;s ice cream shops are pleased at the long lines! Civic pride is obvious in this attractive town. There are flowers everywhere, but the ones we enjoyed the most rimmed the boardwalk around the harbor. Cruisers enter Kincardine Harbour through two concrete piers. The northern pier is marked by a flashing trisector light. Situated as it is, strong westerlies create quite a surge down the channel. We set our GPS waypoint at 44 degrees 10.75 minutes north, 81 degrees 30 minutes west, which brought us about one-quarter mile off the pier. As there are no anchorages, visitors stay at the Kincardine Marina, which is managed by the friendly members of the Kincardine Yacht Club. Their basin, like the channel, is dredged to a depth of 7 feet annually. For more information, visit the Kincardine Yacht Club website at kyc.ca. Bayfield Bound Our next port of call was Bayfield, Ontario, some 40 miles south of Kincardine. This village is home to only 900 people compared to Kincardine&apos;s 7,000. Population swells during the summer with cottagers and seasonal visitors coming to enjoy the tree-lined streets, the 19th-century architecture, and the pleasant atmosphere. We used a GPS waypoint of 43 degrees 34.60 minutes north, 81 degrees 43 minutes west to approach Bayfield Harbour. The entrance is between two concrete piers—the north pier with fixed green range lights and the south with a fixed red light. The river, up to the bridge, is dredged to 8 feet. While in Bayfield we docked at the Village of Bayfield Marina. On our first visit some five years ago, it happened to be the only marina that answered our radio call one blustery Monday. The dockmaster was there to greet us, offer us a ride to the grocery store, and answer all of our questions. After such hospitality, we did not think twice about where to stay on our return. However, if you check PORTS Cruising Guides (my cruising bible for the North Channel) published by Formula Media Group, you will see that there are three other marinas lined up along the Bayfield River. Bayfield is a more upscale area. The smallish supermarket is situated away from the downtown and the main street is strung with boutiques and their enticing offerings. Many tourists amble along its three or four blocks and sit out at the restaurant patios. The storefronts are adorned with flowers and everyone seems to be in a holiday mood. The flat terrain is ideal for biking; that is, after you have hauled your bicycle up the steep hill from the harbor basin! Progress is only slowed if you are an incurable camera buff—too many photo-ops! As the meals in the various eateries were priced a little beyond our cruising budget, we just stopped for lunch while "doing the town." The Albion makes good pub grub and King&apos;s Bakery provides good dessert treats. For our first supper in port, I made Red Flannel Hash (see recipe below). It is quick, tasty, and made completely from items that you do not have to refrigerate—a holdover from our camping days. It is a mainstay meal that allows us to invite another guest or two by adding an extra potato. If guests do not materialize, the leftovers are great with a fried egg in the morning. We enjoyed three nights at Bayfield but would have liked to stay over one more. We missed walking through a wildflower sanctuary and attending a 140-year-old fair held at the end of August. The threat of an impending thunderstorm, along with that summer&apos;s perennial high winds, sent us scurrying back down south to Sarnia, Ontario. Sunsets alone should beckon you to the eastern side of Lake Huron. In fact, Kincardine boasts the world&apos;s best sunsets. Cruising here is both relaxing and picturesque and I look forward to the western trek up Lake Huron to the North Channel someday. Documentation Cruising post-9/11 requires documentation to ensure worry-free call-ins. Luckily, Lake Huron is an area covered by the United States and Canada&apos;s Nexus agreement. The bi-national Nexus program is administered by both the Canadian Border Services Agency and United States Customs and Border Protection. A Nexus card (U.S.$50 for 5 years) allows cruisers to easily travel both sides of the border. 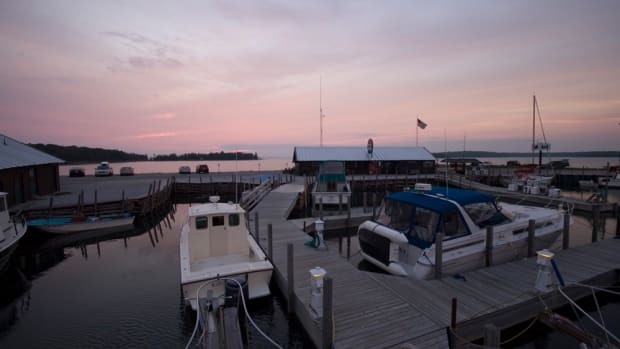 The card was created to ease recreational travel by land or water around traditionally busy border-crossing cities, but the area has been extended to include all of Lake Huron for the 2007 boating season. For more information on Nexus, visit the CBSA website at cbsa.gc.ca. ; the USCBP website at cbp.gov; or call 1.866.NEXUS.26 (United States and Canada). In a frying pan, sauté the corned beef and onions in oil or butter until the onions are translucent. Add the remaining ingredients (except milk) and cook on medium heat for about 10 minutes. Add the splash of milk to the base to give it a crust. Cook for another 5 minutes and it will be ready. But you will probably have the crew appearing to ask about supper by then—such is the powerful aroma of frying onions! Serve with a salad and crusty bread or biscuits. Serves four people. About The Author Jacky Crawford was born in England and grew up in rural Ontario, Canada. After raising a family and retiring from teaching, a restless Jacky discovered new worlds waiting to be explored. 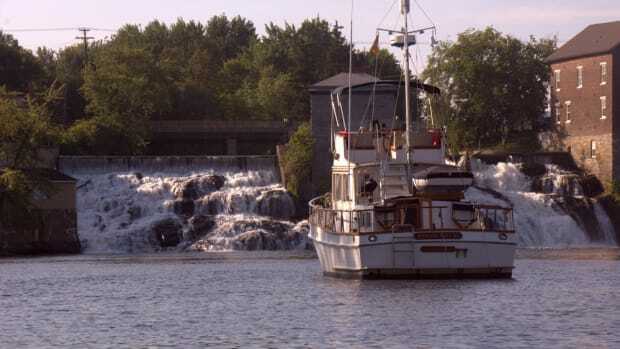 Having traded camping weekends for boating weekends some 20 years before and then swapping their sailboat for a trawler, Jacky and her husband, Larry, dreamed of taking their trawler south and missing at least one snowy winter in Canada. 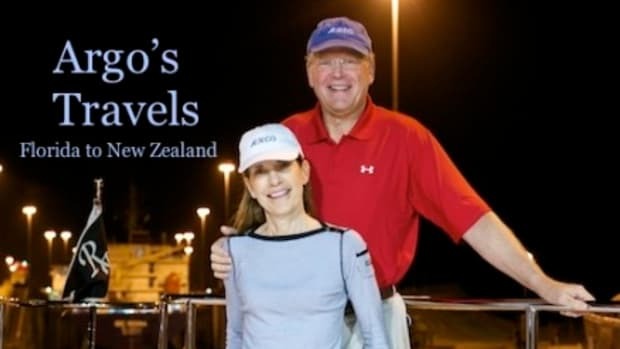 The couple became captain/photographer and first mate/writer during an undeniably life-changing journey from Canada to Florida (see "America&apos;s Accidental Ambassadors" PMM Sept. &apos;06.) 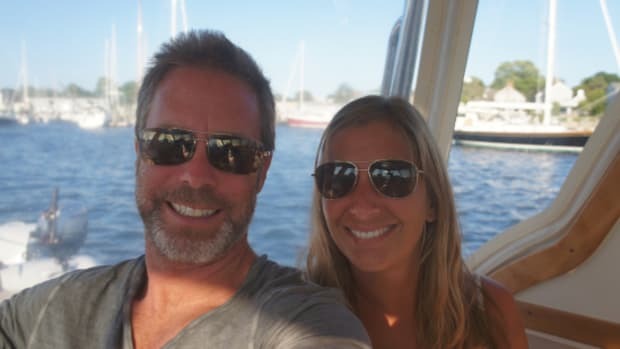 After becoming members of the boating community and sharing the beauty of America&apos;s Intracoastal Waterway, the Crawfords returned home to examine their lives with new eyes and continue to cruise more local waters.